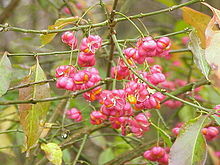 Spindle Wood (Euonymus Europaeus, L.). British Wild Flowers. Chest of Books. 2009 [2009-09-24]. Euonymus europaeus L. European spindletree. Natural Resources Conservation Service. US Department of Agriculture. 2009 [2009-09-24]. Euonymus europaeus European Euonymus Celastraceae. University of Connecticut Plant Database. University of Connecticut. [2009-09-24].